1. I ran over to the Hob Lob and bought 3/8 of a yard of fabric. Total price: S2.38. Then, cut it (tore it, actually) down the middle. It's best if you choose one that is the same on both sides. 2. 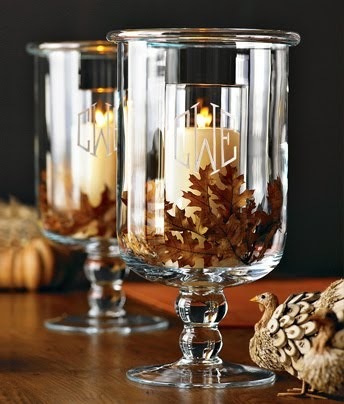 Then, tie the knot in the back against the wall to bring the two pieces together so you'll have a piece that's long enough for a big lampshade. 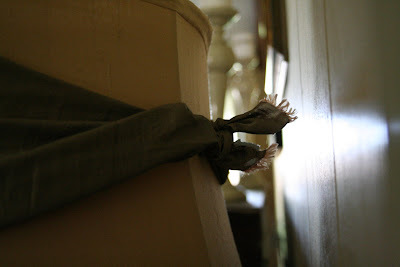 If you have a small shade you probably can get by without having to tie two pieces together. 4. 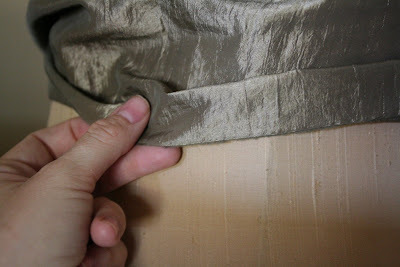 Tuck the frayed edges under, cut stray strings, and just kind of froof it. I also added a few dabs of hot glue here and there to make it stay where you want. That's it! Much better, don't you think?? I have been a slacker about reminding you of the big paint party, one week from today! I cannot wait to see what y'all have to share. I would love to see you there! Genius! She's all dressed up now, isn't she? How beautiful! I never knew it could be that easy. I've got a great corner to hide that knot in the back too! Thanks for the inspiration and I'll be back for your paint party. Sounds like fun! Even better than a ribbon--i love the lushness and thickness! Love it! What a clever idea. 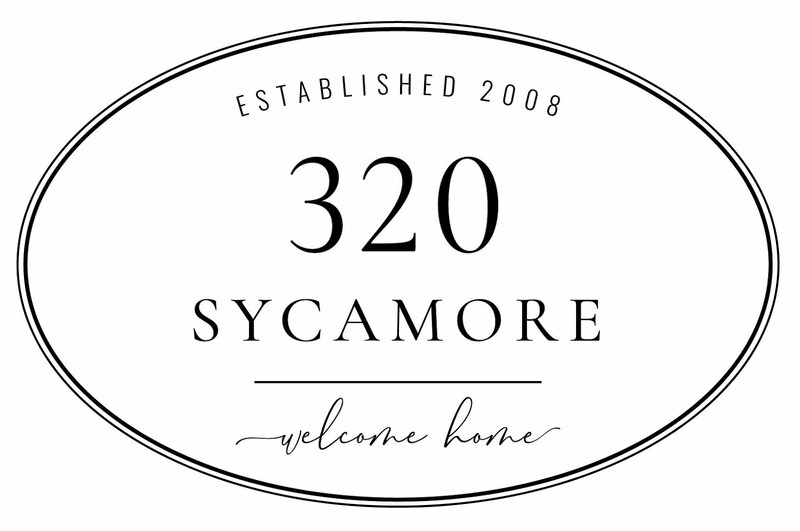 I just found your blog...AMAZING!! I'm new to the blogging thing but would love to participate in the big paint party...sounds like fun! Love the lamp! And of course I'll be there for the party! 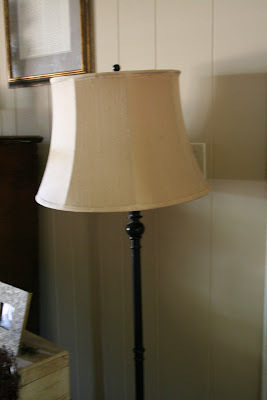 i have a great cheap lamp from big lots that could use a strip of fabric around it! that looks so great and adds a little something extra!! love it!! How funny. 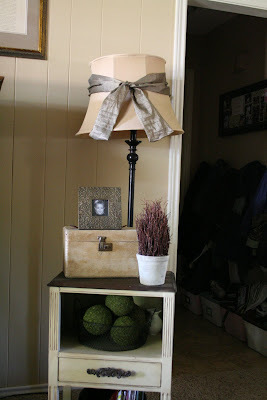 I just came from Amanda's blog and saved her picture of the ribbon wrapped lamp to copy for later. 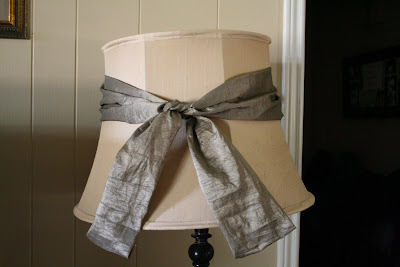 Now I know that if I can't find ribbon, I can still make a cute lamp. Love the idea! Such a stylish and simple solution! It looks lovely! What a great idea for a lampshade! I'm hoping to have my "blue" project done in time for your party! She's the belle of the ball! Love the bow! It adds so much to the lamp! 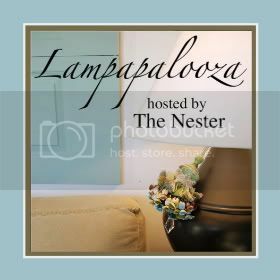 Love the lamp, can't wait for the party! LOVe it! It turned out beautifully. Thanks for the shout out friend! 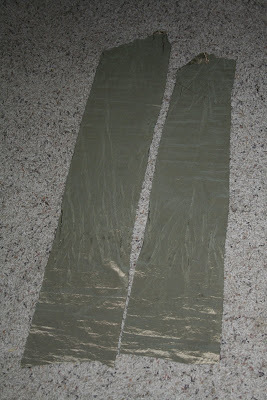 I also like to use strips of frayed fabric to tie up packages. Actually, any excuse I can find to use ribbon or fabric...that's me! What a difference. Looks wonderful. Blessings!